The morning started off much like the previous evening ended. We were now on the other side of the city Andahuaylas and on top of a different pass. The tallest mountains and snow caps were no longer visible. Despite all of that, we still got to witness fog crawling up the side of the valleys without obscuring our view to the distance. Rising early also gave us a chance to see some wonderfully warm light on the foreground. The morning started with us heading towards the city of Ayacucho via the town of Uripa. At this point, we were still following Ruta 3S, which treated us so well in our limited look the previous day. 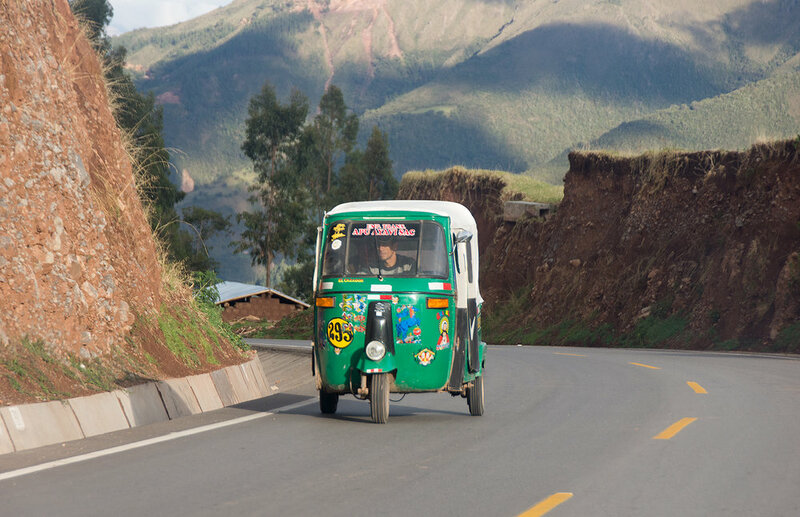 A determined driver taking his tuk-tuck to the limit on the hill leading out of Uripa. The moto-taxis are very limited in power, and this hill is about the steepest that they can manage. Once we reached Uripa, we had to make an unplanned stop for over an hour. Our rental car, a 1995 Nissan Patrol, needed an inspection. It was mostly running fine (aside from carburetors being a pain), but there was one fault we needed to look into. The oil pressure gauge was reading anywhere between “too much pressure” and “no pressure” depending on how the car felt at the precise moment. It was still early in the morning, so we had a challenging time finding an actual mechanic ready to look at the car. The first place we went to, a gas station, came to the conclusion that “there’s oil in it.” Not helpful! The second place didn’t open until 9AM, which wasn’t for another hour and a half. Our third stop did the trick. We were still wary about the quality of the mechanics, but at least this guy had one sign of competency: actual engine lifts in his garage. He took a look at the car while the gauge was reading zero. He shut the car off, removed the oil cap, and had us start the car with his hand over the gap. The gauge still read zero, but he was able to feel that there was pressure. His diagnosis: the gauge was broken, not the engine. With that information we were able to continue onward, avoiding an expensive and time-consuming repair. We were planning on looping back through La Paz in a few days, where we could let the person who rented us the car take a closer look. Buoyed by increased faith in our car, we pressed onwards. 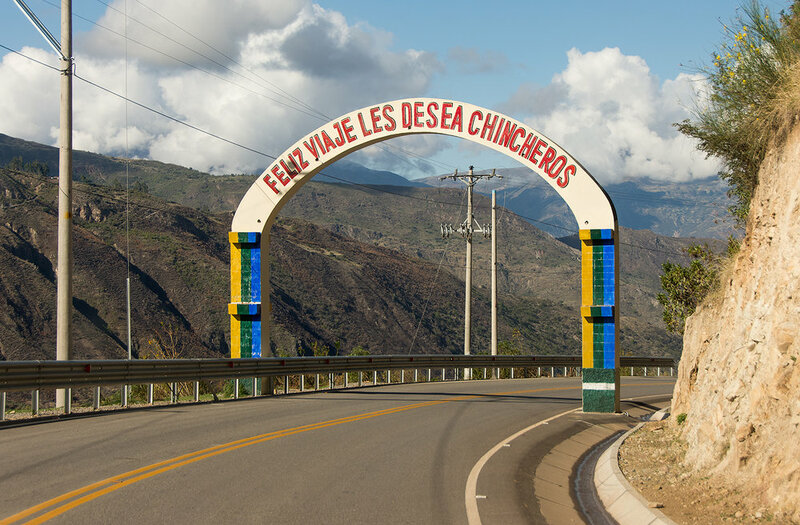 Some towns, like the village of Chincheros, have fancy gates and arches to welcome travelers. After the villages of Uripa and Chincheros, Ruta 3S climbs back up to about 13000 feet on the final ridge before reaching Ayacucho. Unlike the other passes we’d driven, it leveled out into flat plains and grasslands before descending back into the valleys. Finally, we reached Ayacucho. Unfortunately, I don’t have many photos from there, since I was navigating and road closures made things extremely difficult. Peruvian cities are very poorly signed, so thank goodness for a working cell phone with Google Maps. More tuk-tuks were all that I was really able to capture. After Ayacucho, we diverted off of Ruta 3 for the first time. Our new route was Ruta 24, which cuts from Ayacucho to Pisco, across the rest of the Andes to the Pacific. Our chosen route crossed the little-known Abra Apacheta (seriously, if you google it in a few days this post might be at the top), a very high mountain pass with absolutely staggering scenery. The landscape got weird quickly. We were above the treeline for a good portion of this journey, and the greenish-yellow shrubs created a surreal coating for the land. This particular photo reminds me of Paso Roballo, a mountain pass between Chile and Argentina about 4000 miles further south, which Jake and I drove three years ago. This pass was llama country. Here’s a woman taking hers for a walk. The air quickly became thin as the road continued to climb. This pass’ peak was over 2000 feet higher than anything we’d done in the previous day. As we approached the summit of Abra Apacheta, the line at which the grass stopped became visible. The bald hills revealed underlying browns and reds, mixed with black volcanic rocks peppered among the minerals. Above 15000 feet, we really started to feel like we were at the frontier of the planet. It was easy to travel here (the road is completely paved), but the odd colors and landscape were unlike anything we had ever seen before. We knew that we were going to see scenery like this eventually, but we thought it would be further south, in our Bolivian leg of the trip. But here, in the high plains of Abra Apacheta, we stumbled onto this unexpected goldmine of bizarre landscapes and took as much advantage as we could. Here’s the peak, unceremoniously marked by a small sign. 4746 meters above sea level is 15560 feet, higher than the Rockies, the Sierra Nevada, and almost all of the Alps, and we were still driving. The views on the way down weren’t any less stunning. On our way down the mountain, we came across… this thing. There isn’t a lot of information on this pass online, so whatever this is remains a mystery to me. Given where it is (15000 feet up in the Andes), it’s probably volcanic, but we don’t know for sure. We also didn’t know it was here before passing it, and discovering such things is definitely part of the adventure. So, for one of the first times, people can enjoy pictures of… whatever this is. Photos from the end don’t really capture how big this was. Here’s a photo with a rock-walled building (maybe 6 feet tall) for scale. Unfortunately there was no apparent way to get down and look at the formation from the ground level, which would have really been an amazing spectacle. Continuing down the road, we get a picture of the white thing from downstream. Unfortunately, the descent from Abra Apacheta to Pisco was not very photogenic. It winds through a deep canyon, but we were heading westward (into the sun) in the afternoon, so exposure was just about impossible. We also stopped for lunch and got fresh river trout. It wasn’t a bad afternoon’s drive, it just didn’t lend itself well to photos. 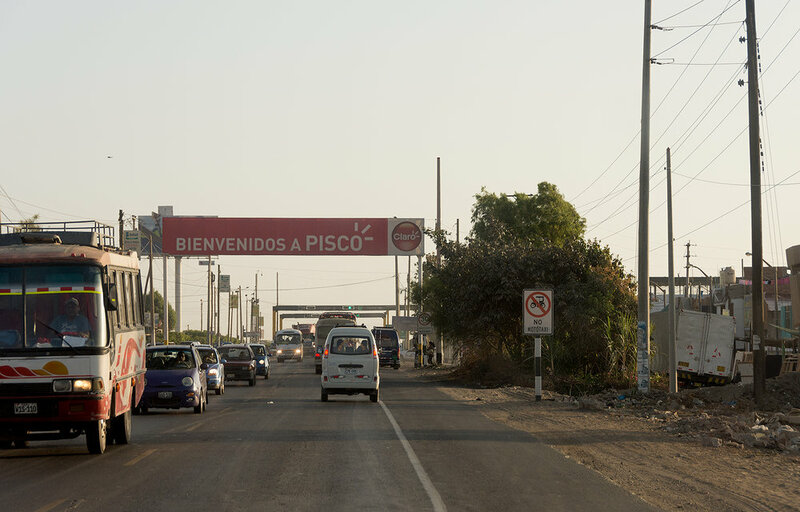 At about 5:30 in the afternoon, we reached the outskirts of Pisco, on the Pacific Ocean. We descended 15000+ feet of altitude in about four hours. The extra oxygen was certainly welcome, and its effects were dramatically demonstrated by several thoroughly crushed water/tea bottles in the back of the car. The day ended on the Panamerican Highway. This will be our main road for a good portion of Part 7. 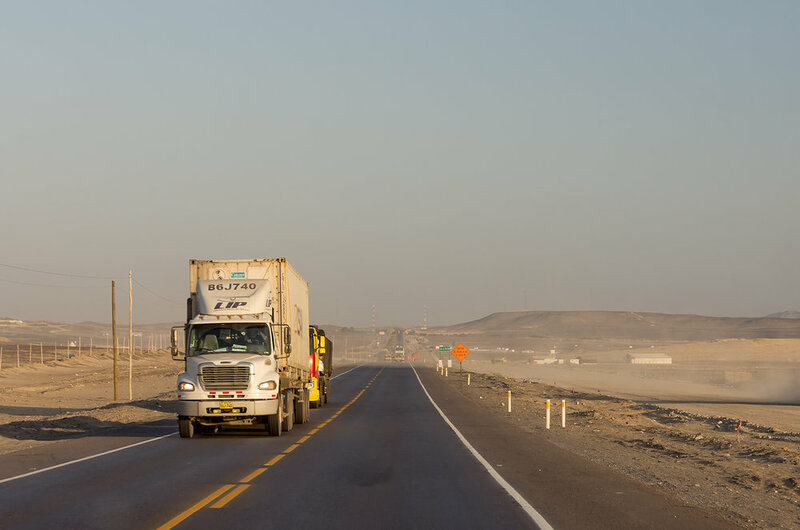 It’s the biggest truck route in Peru, and is a part of a network of roads which stretches from Alaska to Argentina (with a few unofficial sections and a small gap in Panama). In this section of Peru, the road runs through sand dunes and along the ocean. The day closed with us desperately trying to make it through the large city of Ica before dusk. As we found in Andahuaylas the previous night, driving through a Peruvian city after dark can be pretty scary due to the manic driving style. We hit Ica right as the sun set, and made it through unscathed (though we almost hit a motorcycle turning left from the right lane at one point). After nightfall, we continued all the way south to Nazca. We didn’t see the famous Nazca lines, but it was a tourist town with showers, hotels, and a bar (after a day like this, we deserved a pisco sour or two and didn’t have to worry about their effects on slowing down altitude acclimation). The night drive also made up for time we had lost on the previous day, and set us up well for the remainder of our time in Peru.